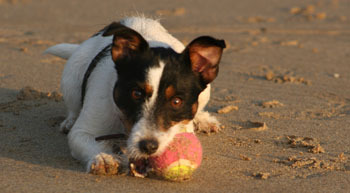 I am Millie a young Jack Russell, Cornish born and bred, who is lucky enough to live in Cornwall. I didn't have the best start, but was rescued and given a new home by my present owners. I now get the chance to explore Cornwall and have set out some of my favourite dog friendly places in Cornwall including days out and walks with dogs, dog friendly beaches in Cornwall, places to eat with dogs and dog friendly accommodation in Cornwall. Coming on holiday to Cornwall can be great fun for us dogs but can be a little restrictive for our owners as for some reason we are not allowed to go everywhere they are. Set out below is hopefully some helpful information on dog friendly places in Cornwall and things you and your owner can enjoy together. Please remember that there are many hazards for dogs in Cornwall that you may not have at home such as steep cliffs, powerful seas and adders which can bite and kill dogs, please click the link to read more about hazards for dogs in Cornwall. One final thing, please, please make sure your owners CLEAN UP AFTER THEIR DOG there is no excuse not to and not doing is the reason we are not allowed in lots of places. Many of the Cornish Beaches have seasonal restrictions which ban dogs going on the beach, usually from Easter Day or a day in March or May until 1st October - some allow dogs in the early morning (before 7 or 8 depending) and late evening (usually after 7). Look for the sign at the entrance to the beach. To help view my list of dog friendly beaches in Cornwall which allow dogs all year. Some tourist attractions and many gardens allow dogs. Dog Friendly Days Out in Cornwall include Gweek Seal Sanctuary, The Cornish Cider Farm (I haven't been but is on my list to do), or Trebah Gardens. A favourite dog friendly places to visit of mine is Lizard village on the Lizard peninsula (pictured above outside the dog friendly cafe at Lizard Point). A very dog friendly place in Cornwall as there are lots of walks and dog friendly places to eat. See my list of Dog Friendly Days Out in Cornwall for more info. Obviously, as with most places many restaurants in Cornwall wont allow dogs. This doesn't stop you and your owner enjoying eating out though as there are many Cornish pubs, cafes and eateries that are dog friendly and will allow dogs inside. Plenty also have outside seating where dogs are allowed and don't forget picnics. View my list of Dog friendly places to eat Cornwall or view my Top Ten Dog Friendly Places To Eat Cornwall. Please see my list of Dog Friendly Accommodation Cornwall. The walking in Cornwall is excellent and there are lots of fantastic places to go. The Cornish Coast Path runs along most of the coast and so you are never usually very far from a walk with dramatic views. I enjoy walking on Perranporth beach and around the village of Lizard. Godrevy is also a good place to walk. Out of season you are allowed on the beaches and when restrictions are in place you can walk along the coast path for as long or little as you like. Remember to keep dogs on leads around the cliffs and beware of Adders, particularly in Spring and Summer. I love walking at Trelissick park and woods. This is a National Trust property found just off the main road from Truro to Falmouth and set by the River Fal and Fal Estuary. I am not allowed in the gardens but there are good circular walks around the woods of differing lengths. They are well mapped out on the information board at the car park. If you have thought hard and decided you would like to introduce a dog into your family please please consider rescuing one of the many dogs who are desperate for a new start and new home. There are many dog rescue centres in Cornwall. I am very grateful to the Canine Crusaders who rescued and re homed me. They are a great dog rescue organisation in Cornwall and have many dogs ready for new homes. Please click the link and have a look at their Blog Canine Crusaders. If you are not looking to re home a dog you could attend one of their many events with your dog such as the annual auction or Christmas and Summer fairs to help support them. They do excellent work rehabilitating dogs and all support is welcome. If you live in Cornwall you could even volunteer at their kennels! A walk around Newquay Cornwall - maybe not in August but most of the beaches in Newquay are dog friendly and so it is a good place to visit with a dog at quieter times. Wrap up warm and watch stormy seas. If you would like to recommend somewhere in Cornwall which is dog friendly I would love to hear from you and pass your recommendations onto others. I love to hear from other dogs who are enjoying Cornwall as much as I am and it is great to pass on the news of a newly discovered or old favourite dog friendly place in Cornwall - maybe I will bump into you there! We have heard about two risks to dogs health that we would like to share with you. Following incidents in Cornwall, and many beaches around the UK, in 2014 and again in 2015 in relation to Palm Oil which is toxic to dogs, unfortunately Palm Oil has reared its ugly head again on Cornish beaches. If anyone has any more information on this we would be grateful to receive it. As at January 2016 signs have been put up on at least five beaches in North Cornwall warning of a health risk to dogs posed by a white substance (believed to be palm oil) that has been washing up. Cornwall Council says it has received reports of a white waxy substance being washed up on Porthcothan, Treyarnon Bay, Constantine Bay, Harlyn Bay and Trevone. One vets surgery in St Columb says five dogs have come in for treatment after owners thought they had come into contact with it. We are also aware that Palm Oil has recently been seen on the beach at Port Quinn in North Cornwall and Palm oil deposits have been sighted across Harlyn Bay, Trevone Bay and Porthcothan North Cornwall and also now on Widemouth, Crooklets and Summerleaze beach in Bude and also unconfirmed sightings on Perranporth and Portreath beaches - the oil appears to have become 'desiccated' and was washing in in large quantities on 7 January 2016 in the afternoon. These smaller pieces differ from the single, larger lumps that we have seen in the previous couple of years. It would be very difficult to keep dogs away from so many small pieces strewn across the sands so it is best to avoid taking dogs to these beaches for the time being or keeping them on a lead and under close supervision. Vets are warning dog owners to be vigilant and to take their dogs straight to the vets if they suspect they have eaten some. The palm oil is toxic to dogs. The Perranporth and St Agnes vets centre say they have treated many dogs for this last year and some dogs have died. People are being told to keep an eye on their dogs at all times on the beaches (which they should do anyway). We would suggest simply avoiding suspected infected beaches with your dog until the problem is sorted out. If your dog is affected prompt action is crucial, and can save the dog's life. A tell-tale sign that your dog has ingested some palm oil is the smell of diesel oil on its breath. In 2014 there was a big problem with palm oil on Perranporth beach. 2016 is seeing the problem higher up the North Cornish Coast and there could be other beaches which have been affected which we are not aware of. People are also being asked to warn other dog walkers about this as they may not be aware. Quality dog friendly self-catering accommodation near to St Austell Cornwall where you & your dog (or dogs) can stay together www.bedandbasket.co.uk. Outside the beach dog ban restriction season many Cornish beaches will allow dogs. View our list of Cornish beaches for ideas of where to visit with your dog during these times. Destinations in Cornwall view our GUIDE TO PLACES IN CORNWALL To help find the ideal place for you. There are lots of beautiful places in Cornwall for you and your dog to explore together. From picturesque harbour villages such as Mousehole, Polperro and Padstow to the bigger towns of Penzance, Looe and Bodmin and beach side places of Perranporth, Newquay and Bude.